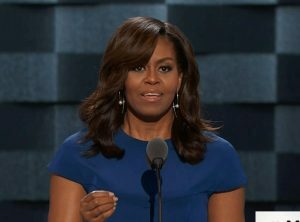 On the first night of the 2016 Democratic convention, First Lady Michelle Obama spoke as a mother, a wife, First Lady and an intelligent black woman. As an African American woman, her words resonated to me in ways far beyond her text. In her authenticity, Michelle Obama spoke truth to power, gave a history lesson, a lesson on motherhood and shared her hopes for the future of our country. And she left me and perhaps others feeling a little more hopeful than I’ve felt in a while. First Lady Michelle Obama spoke about how she has lived the past 8 years in the White House, a house built by slaves, where her two daughters play with the dog on the White House lawn. As a U.S. history major, I know most, if not all, of Washington was built by slaves. But the essence of her speech for me was an acknowledgment of how far this country has come in 151 years since slavery ended. For a black woman to be able to address the Democratic National convention and reference the history of slavery before millions is phenomenal. And she did it in a matter of fact, non-preaching way. But her point was not missed on me. In recognizing the labor of slaves in building the White House, Michelle Obama acknowledged one of the many gifts that my ancestors gave to this country. Despite all of our country’s many transgressions, there can be no denial that change has come to America with the Obamas in the White House. Mrs. Obama was on stage to make the case for Hillary Clinton as the next Democratic nominee for president. And she intertwined her own story of her daughters in making the point. She spoke of Hillary Clinton’s work as a children’s advocate over the years. And she spoke of how her daughters could now take for granted that a woman could be president of the United States. Perhaps the most inspiring and historically uplifting statement was left unspoken. The oldest daughter of the first black president will be able to vote for the first woman president in 2016. Do Black Lives Matter to Police? On Wednesday, July 6, I went to bed upset and angry after learning of another police shooting and killing of Alton Sterling, a 37 year old father of five, who was gunned down by police officers outside a convenience store in Baton Rouge, Louisiana. I woke up on Thursday to discover that another black man, 32 year old Philando Castile, was shot and killed by police officers outside St. Paul, Minnesota for attempting to get his driver’s license and registration, after being stopped for a broken tail light. Both incidents were caught on tape. In the case of Castile, his girlfriend who was in the vehicle at the time, livestreamed the aftermath while emotionally distraught. 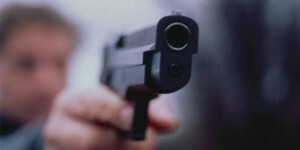 And in the case of Sterling, video exists of the shooting incident. It appears now that police shootings and killings of African Americans are coming fast and furious. In the case of Alton Sterling, a store owner stated that as Sterling lay on the ground shot, a police officer removed a gun from Sterling’s pocket following the killing. As usual, the officers have been placed on administrative leave and the Justice Department is investigating. In Castile’s case, he was trying to comply with the officer’s demands to provide his license and registration during a routine car stop when he was shot and killed in front of his girlfriend and her young daughter. These two senseless police killings of African Americans are added to the list of many others in the U.S.
Castile’s mother is quoted as saying her son was just “black in the wrong place.” But that begs the question of where is the right place in the U.S. for African Americans to avoid being shot and killed by police. I doubt if anyone has the answer. Castile’s girlfriend says that the police are not here to protect and serve but to “assassinate” African Americans. Many persons are calling the police shootings and killings of African Americans as the 21st century lynchings. According to recent reports, 1150 persons were shot and killed by police in 2015. Of those, almost one third were African Americans. Yet, African Americans only make up 13% of the U.S. population. Charges were only brought in 3% or 34 cases out of the 1150 killings. These senseless killings of blacks run the gamut from college educated Jonathan Ferrell in Charlotte, NC, who was seeking help from the police following a car accident to 50 year old Walter Scott, who like Castile, was stopped by police for a busted tail light. Scott was running away from police when he was shot in the back by then officer Michael Slager. He is awaiting trial on murder charges. And without having bystander citizen video, Slager would not have been charged. From Eric Garner in NY, LaQuan McDonald in Chicago, Samuel Dubose in Cincinnati to 12 year old Tamir Rice, playing on a playground and the many other innocent and unarmed blacks killed at the hands of police, there is an apparent epidemic of police brutality perpetrated at blacks in the U.S. Nowhere is safe. And no black person is safe from police brutality. In order for a police shooting or killing to be justified, the police officer must fear the loss of his or her life or serious bodily injury. And in the cases of unarmed blacks shot and killed, that’s what police officers purportedly state—despite video often showing the contrary. Historically, many blacks have been killed since slavery times through the civil rights era and up to present times. But the question is where do African Americans turn to for help when the protection needed is from those police who took an oath to serve and protect citizens? Law enforcement officials are often quick to decry that blacks don’t like police and don’t want police intervention. Most African Americans are not anti-police. However, African Americans are anti-injustice. The problem of police brutality is becoming mainstream news—although many in the African American community have known about the problem for many decades. And without videos by civilians and social media, the problem would not be receiving the present attention. The U.S. must go beyond seeing the problem of police killing blacks to seeking viable solutions. Black lives must matter to the police. Washington, DC based Debbie Hines is a trial lawyer, legal analyst and former prosecutor who is often seen in the media speaking on criminal justice issues.